3 November 2010, at 9:36a.m. GLOBAL - Novus International Inc. has announced a new Novus Scholars partnership with Egerton University located near Nakuru in Kenya. The agreement, signed earlier this month, details how Novus International will assist the University in developing its local capacity as well as support the local feed industry by providing equipment and training. Dr Giovanni Gasperoni, Executive Vice President, Marketing and Sales, Novus International, said: "We have established a repeatable model with our Novus Scholars programme that benefits students, professors and our employees. I have witnessed the growth of these programmes. They are encouraging knowledge transfer and developing real employment opportunities for graduates." Working with multiple universities around the world, the Novus Scholars Program awards professors and students who are, or will be, industry leaders in agriculture with scholarships and fellowships. Dr Gasperoni added: "Through these programmes, we have established a network of technical collaborators that help us develop relevant customer solutions for diverse regions around the world." The Novus Scholars Program in Africa aims to improve education and first-hand knowledge of animal health and nutrition in the African scientific communities for livestock and aquaculture. The partnership will allow two Egerton employees with a background in analytical chemistry and laboratory analysis to receive hands-on training at Novus's Saint Charles, Missouri, USA, Research Laboratories for a period of approximately 90 days. Once training has been completed, Novus has agreed to assist with equipment and capacity building development of an analytical laboratory at Egerton University. 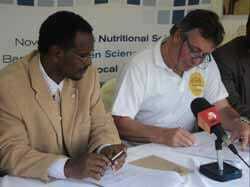 This laboratory will serve the East Africa regional feed industry. Through Egerton, Novus also plans to establish a reference laboratory to support the industry in the East Africa regional community (Kenya, Tanzania, Uganda, Rwanda and Burundi). Founded in 1939 through a land grant of 740 acres by Lord Maurice Egerton of Tatton, the University was originally named Egerton Farm School. The name later changed to Egerton Agricultural College and offered a one-year certificate and two-year diploma course in agriculture. In 1987, the College was officially recognized as a Chartered Public University. Today, Egerton University offers Bachelor of Science degrees in Agriculture, Food Science and Technology, Water and environmental engineering, Agriculture Economics and Horticulture.